"Don't Troube Yourself With Details"
Elevenses is an adventure, a quest, a comedy, and a parodic stew. It is a collaboration between two writers whose identities must remain anonymous, for security reasons. Here you will find an original adventure — a story of daring exploits, strange happenings, complete idiocy, and a hefty dose of authorial insanity. There are also enough references to pop culture, not-so-popular culture, and caricatures of recognizable characters to teeter on the precarious edge of blatant rip-off. But we like to call it “paying homage” to rather than “ripping off,” and we hope, dear reader, that you will enjoy this little foray into insanity. And don’t trouble yourself with the details. Elevenses: The Daring Exploits of Secret Agents 1111 and 711 has not been tagged yet. 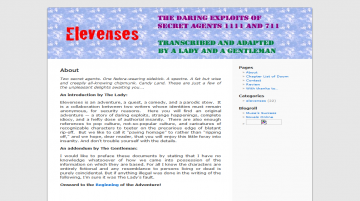 Help others find Elevenses: The Daring Exploits of Secret Agents 1111 and 711 by tagging it! Elevenses: The Daring Exploits of Secret Agents 1111 and 711 has not been reviewed yet. Elevenses: The Daring Exploits of Secret Agents 1111 and 711 has not been recommended yet.